Push-On Cap Nut Fasteners - Bolt Products Inc.
Bowes aluminum push-on cap nut Fasteners provide an attractive and secure means of capping exposed shaft, axle or stud ends. Bowes Cap Nuts are available in four different cap nut designs that are all easy to install. All our cap nut fasteners can be painted to match the color of your products for decorative purposes. Six contact points on the cap nut fastener to bite hard on the shaft circumference holding it under vibration resistant live spring tension. Fasteners are easy to install. Aluminum push-on cap nuts are available in a wide range of sizes and designs. The wide diameter of the cap acts as a spanner washer distributing the holding power of the fastener over a wide area around the stud. Cap nuts have six point contact (available for most stud diameters) on the shaft circumference assuring maximum holding power and resistance to loosening by vibration. Within the styled aluminum cap is a tempered spring steel or optional stainless steel insert which grips the shaft or stud. The single O.D. design allows the fastest possible assembly with minimum part handling and stock inventory. Cotter pins and washers and threading and drilling operations are eliminated. Aluminum push-on cap nut fasteners have been successfully used in a variety of OEM applications including building insulation, ship insulation, light wheeled toys, stereo cabinetry wiring, retaining electrical wires within panels, automotive emblems and more. 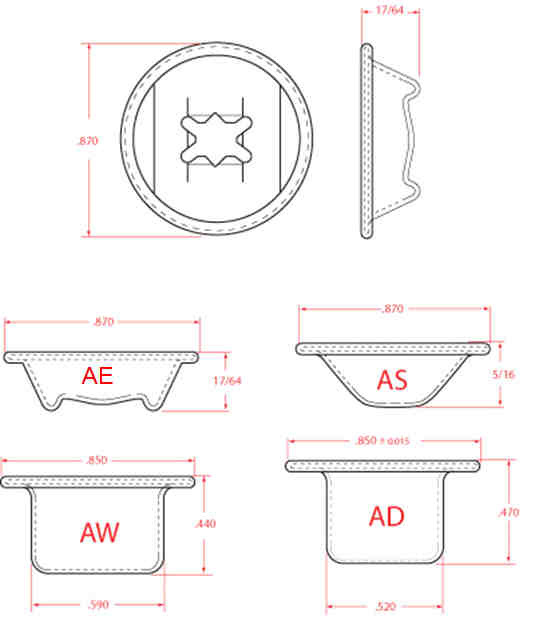 Bowes Aluminum Push-On Cap Nut Fasteners are available in several attractive cap designs (AS, AE, AD and AW) as shown for stud sizes ranging from .080" to .500". Bowes cap nuts should be positioned squarely over the stud and pressed into the locked position by hand or with the light tap of a mallet. The fastener has six contact points that bite hard on the shaft circumference holding it under vibration resistant live spring tension. Bowes also has an aluminum push-on cap nut to cover a standard hex nut that measures 7/16" across the flats. All caps can be painted to match the color your products for decorative purposes. 14 = .014" 22 = .022"
All dimensions in inches, standard tolerance. Fractions +.010-.010. Decimcals +.005-.005. Unless otherwise noted. Selections listed are currently available. Other cap materials, stud diameters, insert thickness and finishes are available upon request.